Both a companion to Introducing Sociolinguistics, Miriam Meyerhoff’s bestselling textbook, and a stand-alone Reader in sociolinguistics, this collection includes classic foundational readings and more recent innovative articles. Intended to be highly user-friendly, The Routledge Sociolinguistics Reader includes substantial section introductions, further reading, a reader’s guide on how to use the book and an introductory chapter providing advice on how to undertake qualitative and quantitative research. This introduction is supplemented by exercises focussing on data handling and collection. The Reader is divided into six sections and each section is thematically organised. Each reading is accessible to beginning students of sociolinguistics but the entire selection is assembled to also help advanced students focus on themes, principles and concepts that cut across different researchers' work. Beginning and advanced students are supported by Content Questions to assist understanding of essential features in the readings, and Concept Questions which help advanced students make connections across readings, apply theory to data, and critically engage with the readings. A companion website supports and connects the Reader and textbook with structured exercises, links to associated websites and video examples, plus an online glossary. 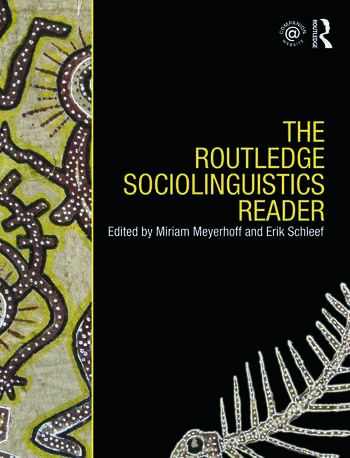 The Routledge Sociolinguistics Reader is essential reading for students on courses in sociolinguistics, language and society, and language and variation. Social stereotypes, personality traits and regional perceptions displaced: Attitudes towards the ‘new’ quotative in the U.K.
Miriam Meyerhoff is Professor of Linguistics at the University of Auckland, New Zealand. Her work investigates language variation and the interplay between language and social identities, using qualitative and quantitative methods. She is author of Introducing Sociolinguistics, and co-editor of the Handbook of Language and Gender, as well as Social Lives in Language and the Creole Language Library. Erik Schleef is Lecturer in English Sociolinguistics in the Department of Linguistics and English Language at the University of Manchester, UK. His research interests include language variation and change, language and gender and language acquisition in immigrant contexts. He has lived and taught in the US, the UK, Germany, and Switzerland.